Oelde, November 28, 2018 – 1893 – It was the year of inventions that are still indispensable today, such as the diesel engine by Rudolf Diesel and the zipper by Whitcomb Judson. And 1893 also showed what persistence means. Andy Bowen and Jacke Burke fought a seven-hour, 19-minute boxing match over 110 rounds– with no winners in the end. At the same time, the businessman Franz Ramesohl and the cabinetmaker Franz Schmidt in Oelde, Westphalia, proved their innovative strength, creativity and stamina. They opened a workshop on September 1, 1893, and produced a hand-operated milk centrifuge with the model name “Westfalia”. Ramesohl & Schmidt oHG had three locksmiths and two turners 125 years ago. They produced the hand-operated milk centrifuges with the simplest but effective equipment. Entrepreneurial skills, craftsmanship and technical expertise coupled with a love forinnovation formed the basis for the following 125 years. The roots of the company developed into today’s GEA site, the most modern separator plant in the world. The products “made in Oelde” are supplied all over the world. The export quota is currently over 80 percent. GEA’s expertise now encompasses over 3,500 different processes and 2,500 products for various industries ranging from food and beverage, marine, oil and gas to power, chemical, pharmaceutical and environmental technology. 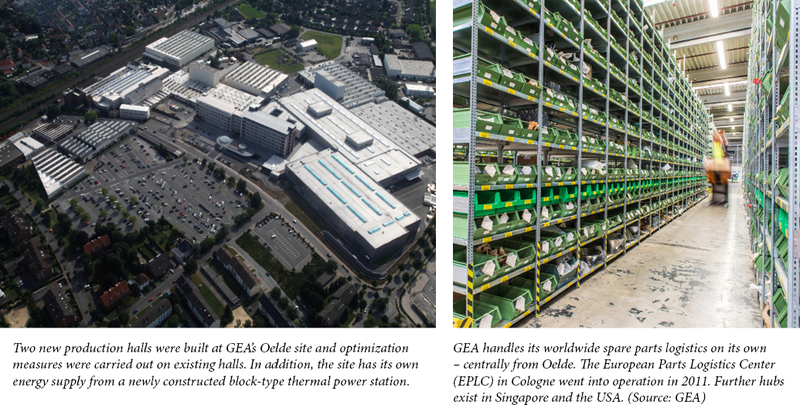 Today, Oelde is GEA’s largest single site worldwide with a production area of around 37,000 square meters. Around 1,900 employees, 180 of whom are trainees, are currently working in the areas of design, production and administration. GEA invested heavily in the site in 2013. “We had and still have the clear ambition not simply to swim in the global competition, but to determine it by increasing efficiency,” says Steffen Bersch, member of the GEA Executive Board, who worked for many years in Oelde himself. For example, the new building in Oelde, which was built in 2013, was essentially based on the idea of sustainability: its own combined heat and power plant with an electrical output of 1.2 MW reduces the CO2 footprint and generates enough electricity to supply more than 2,000 average households. The new separator production enables GEA to optimize processes throughout the entire production process. 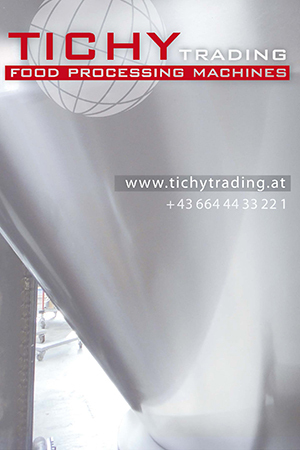 The use of well-trained and committed employees in conjunction with modern production machines and technologies has led to significantly reduced throughput times in the production of the separators and plants, most of which are customized to the customer’s needs, while maintaining above-average product quality. The company’s own Process Test Center (PTC), which opened in 2014 and provides extensive specialist support for customers’ investment projects, also enables even greater customer orientation: Starting with the specification of product properties through the determination and design of machine types to pilot tests at GEA and on site at the customer’s premises. In cooperation with the customer, GEA Product Managers and GEA Process Development, the PTC also develops and tests completely new processes. The PTC also underscores GEA’s innovative strength as a leading international technology group. More than 11,000 tests and process developments as well as more than 18,000 laboratory product analyses have been carried out to date. This know-how is bundled in a database, which is supplemented and updated every year by around 500 new product tests and over 150 process developments. In order to reliably ensure maximum customer satisfaction and continuous machine availability during operation, the supply of spare parts is coordinated centrally from Oelde and in cooperation with renowned logistics companies via so-called hubs. These spare parts centersare currently located in Cologne, Germany (since 2011), Singapore (since 2014) and Naperville, USA (since 2017). At the European Parts Logistics Center (EPLC) in Cologne, around 21,000 different articles – from 5 mm diameter sealing rings to machine parts weighing several hundred kilograms – can be retrieved in the shortest possible time; on average, 250 shipments are handled daily. GEA customers can call this service 24/7 via a hotline. If an order is received by 3 p.m. local time, it is guaranteed to be ready for dispatch on the same day. Particularly urgent shipments even leave the site within an hour. Being successful for 125 years also means rethinking proven product and process solutions and pushing the boundaries to set new standards through new and further developments. In most cases it is applications “behind the scenes”, i.e. not visible at first glance, in which GEA technologies are installed. But these are not infrequently spectacular. Example: Dubai, The Palm. The artificial islands in the shape of a palm tree, visible even from outer space, are built on – and thus produce wastewater. They are cleaned in an underground sewage treatment plant with GEA decanters. The plant has a capacity of up to 15 cubic meters per hour. Or the water treatment of metropolises: Whether in Singapore or India, GEA water treatment plants perform very important services for people, especially in regions with little water but high demand. Another example: cruise ships. GEA separators are used here for heavy oil treatment as well as for treating bilgewater, an oil-water mixture. Simple “discharging” into the sea is strictly prohibited – so solutions have to be found, and GEA is developing them. In the shipping sector, for example, the new GEA marine Separator with integrated direct drive was presented at SMM 2018 in Hamburg. This innovative separator massively changes the working day on board a ship and offers an extremely simple service concept, compact design, more output per square meter of floor space and intelligent connectivity. 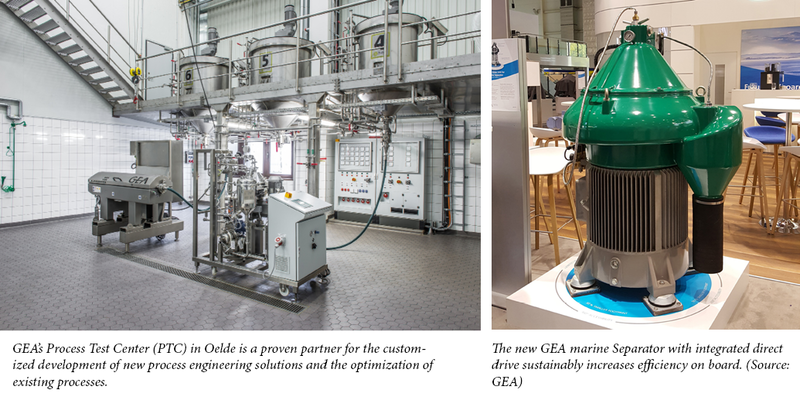 Compared to previous systems, the efficiency of the directly driven GEA marine Separator has been increased to 96 percent. This direct drive requires no belt or clutch. Spindle and motor are available for the first time as a “modular exchange drive unit”. This is exchanged as a complete unit after 16,000 operating hours with a factory-overhauled and OEM-certified drive module, which is delivered worldwide to a location of choice – “Same Day Delivery” is possible. This reduces maintenance on board by up to 90 percent. Separately switchable, intelligent systems such as GEA EffiClean, with which disk stacks can be cleaned in just 20 minutes – instead of the usual up to eight hours – make this innovation very customer-friendly. The core idea behind all GEA developments has remained the same for over a century: The benefit for the customer is the focus of all innovations. For this reason, the innovative concept should also be available for other areas of application in the future. “All these examples demonstrate our innovative strength and the commitment of the entire GEA team. I am convinced that our will to constantly develop and improve ourselves and our feeling for our customers will continue to make us successful,” says Steffen Bersch. GEA is already a solution provider for all kinds of applications. The company has innovative service concepts covering the complete life cycle of the machine and plant, such as monitoring, asset management, consulting and performance optimization for the customer. Continuous innovation and proximity to the customer through the global network and competence centers such as Oelde are further advantages. GEA is already well positioned, says Bersch. However, further major efforts are needed to stay at the top of the world league. And this is where digitalization comes in. “Only by using digital solutions and technologies is it possible to create sustainable and future-oriented products and structures to increase efficiency,” says Tobias Brinke,Head of Product Group Management Separation. According to Brinke, GEA is already in the middle of a digital journey to continue playing at the top of the world league in the future. GEA therefore fills the term “digitization” with new life every day. The continuously and ever faster progressing digitization changes customers, markets and last but not least GEA. Finding the right answers with innovative digital products and services is crucial for tomorrow’s competitive advantage,” explains Brinke. GEA sees digitization above all as an opportunity and a pioneer for new growth and development potential, both in the new machine sector and with regard to the growing range of service solutions. A current example from the service sector: GEA PerformancePlus includes service packages that go far beyond traditional maintenance and are an ideal complement to an industry 4.0 strategy. This uncovers optimization potentials that enable sustainable plant operation. Modern technologies for condition monitoring combined with the know-how of GEA employees provide the customer with meaningful condition analyses and information for decision-making with regard to possible process optimizations – with the aim of permanent availability and maximum productivity.At the same time, changed production requirements can be better assessed and orders can be scheduled in an economically optimal manner. Strengthened by 125 years of success, GEA Separation continues to follow in the footsteps of digital transformation – and so this anniversary not only marks a milestone in the company’s history. At the same time, it is an incentive to push ahead with innovations and continue to improve customer processes and, not least, people’s lives in the long term – in other words, “engineering for a better world”. Next Post: Why is the number 23 560 important for the food and HORECA sector?